Family skaters include, from left, Julia Leykikh, 11, of Fairfield, mom Amber, and Talia, 9, at the opening day at the Westport P.A.L. Rink at Longshore, Friday, Nov. 24, 2017, in Westport, Conn.
WESTPORT— The winter season came to town Friday afternoon when the P.A.L. Skating Rink at Longshore opened up for the season. 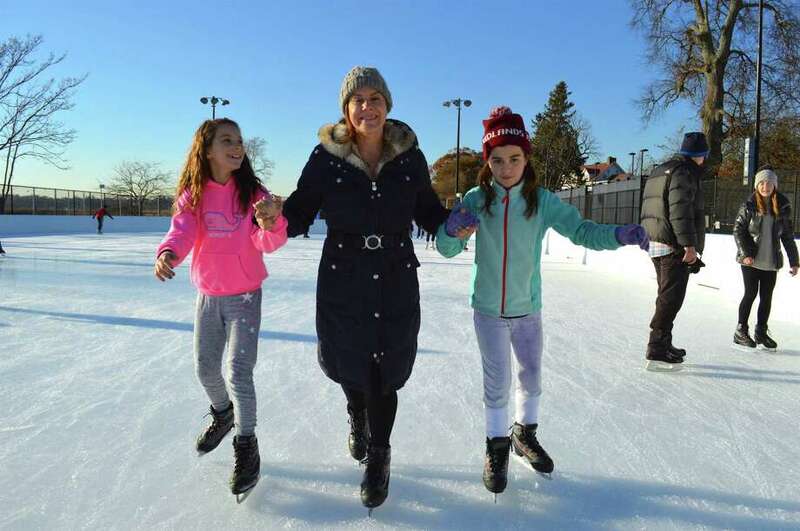 Hundreds of skaters from all over the area took advantage of the picturesque location and lovely weather to visit the rink, which is celebrating its 20th season this year. “You couldn’t ask for a better day,” said Tony Lantier, owner of Thin Ice Management, which oversees the rink at the behest of the town and P.A.L. He said around 45,000 to 50,000 people will visit the rink, which is open seven days a week between now and the first week of March.